Last month Neight Fraser competed at the Otago Primary Schools swimming championships in the 10 yr old boys grade. He swam in the 50 metre backstroke, breaststroke and freestyle and won all three races against children from all schools in Otago. Well done Neight. Last week we sent out enrolment letters to children who will be starting school in terms 3 and 4 and also terms 1 and 2 in 2019. Please contact the office to confirm your enrolment interview time and drop off your pre-enrolment form. If you know of somebody who would like to enrol their child at St Joseph's, please contact the office. When you go for your interview with the principal and Fr Wayne, you will need to bring your child's birth certificate or passport and visa forms and you will receive your enrolment pack. A small pair of child's glasses have been handed into the office. If you are missing a pair of glasses, please contact the office. Our Yr 7 & 8 students will be involved in 2-3 interschools next month. Some of our students will be joining up with St Kevin's College Yr 9 & 10 students are part of the Southern Catholic Quadrangular Yr 7-10 tournament. Permission slips and money for this tournament is due back on Wednesday 6th June. St Mary's Mosgiel come visiting us this time and due to them having only 17 intermediate children, only our Yr 8 students will be involved. This will be held at St Kevin's College on Tuesday 19th June. St Joseph's Timaru intereschool is held in Timaru on Thursday 28th June and involves all Yr 7 & 8 students. Notices and permission slips for both St Mary's and St Joseph's will be sent home tomorrow. Please look for it in your child's bag. Rummage around for those unwanted mobile phones to donate to Sustainable Coastlines Mobile Phone Appeal. Each year at least 8 million Tonnes of plastic ends up in our oceans, the equivalent of a full garbage truck every minute. With “Beat Plastic Pollution” as the theme for this year’s World Environment day we ask for your support by bringing into the school office any unwanted mobile phones you may have and dropping them into the collection box. Phones collected help raise funds for Sustainable Coastlines – a multi ward wining NZ Charity run by a small team of hard working staff and volunteers. Their mission is to inspire, educate and enable others to look after the natural places we love – our beaches and waterways. Our school also benefits by gaining valuable rewards from the Mobile Phones we collect. A reminder about the Pies and Milo happening every Wednesday lunchtime. Bring your named wrapped pie, a cup and 50c for the milo and put it in the hall. Downer have an update on the proposed road works from State Highway 1 from Dee Street to Orwell Street. They had planned to start the work anytime from last Saturday but the weather has cooled down very quickly and winter has arrived. Because of the temperatures, they made the decision to postpone the road works until spring. They will notify us when they commence the road works. There will be no Terrific Thursday on Thursday 31st May as Mrs Brookes is away. 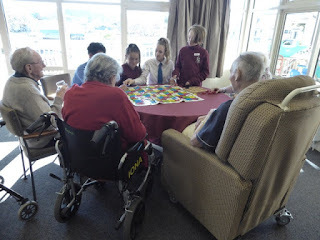 Each Thursday our Young Vinnies (Yr 7 & 8 students) go to various rest homes and interact with the residents for an hour. They play games, read to them, dance and talk to them. 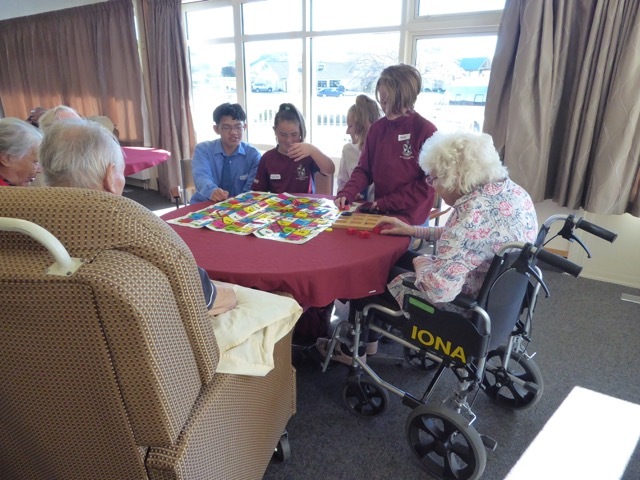 The residents from IONA rest home enjoyed playing games with our students recently. St Kevin's Home and School are organising a Mr North Otago contest on Saturday 13th October at St Kevin's College dining room. They are looking for male contestants who don't mind having a bit of fun showing off different clothing styles on a catwalk. Businesses sponsor your own handsome hero and get together to support him. If you would like a night of fun and laughs, book a table by contacting Paula Brien on 027 437 1291. Poster attached to email.